Inspired by my recent hobby of home brewing, I created a unique grapefruit hop syrup to experiment with. IPAs that have a strong grapefruit palette are my favorite. I’ve found that cascade and amarillo hops have a nice grapefruit and citrus profile to them and I wanted to try this flavor combination in cocktail recipes. Below are instructions to make your own syrup at home. 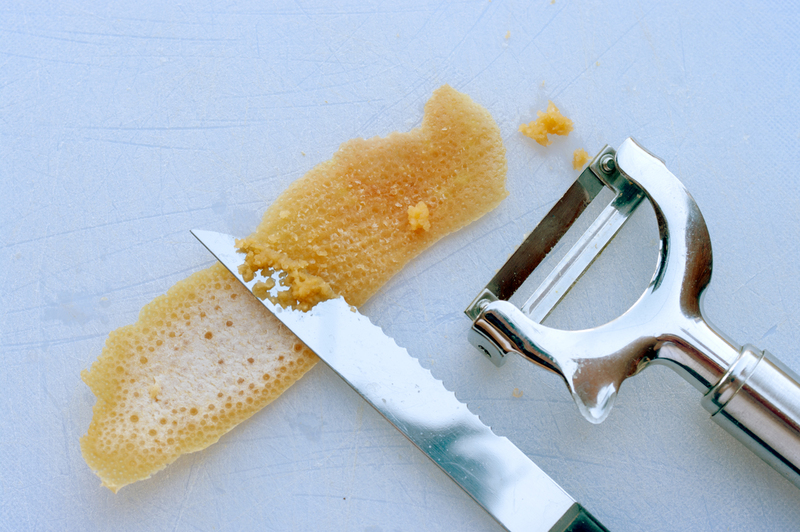 Step 1: Peel one grapefruit with a vegetable peeler. Scrape all white pith off with a serrated knife. Step 2: Boil peels in one cup water and one cup sugar. Let it simmer for fifteen minutes. 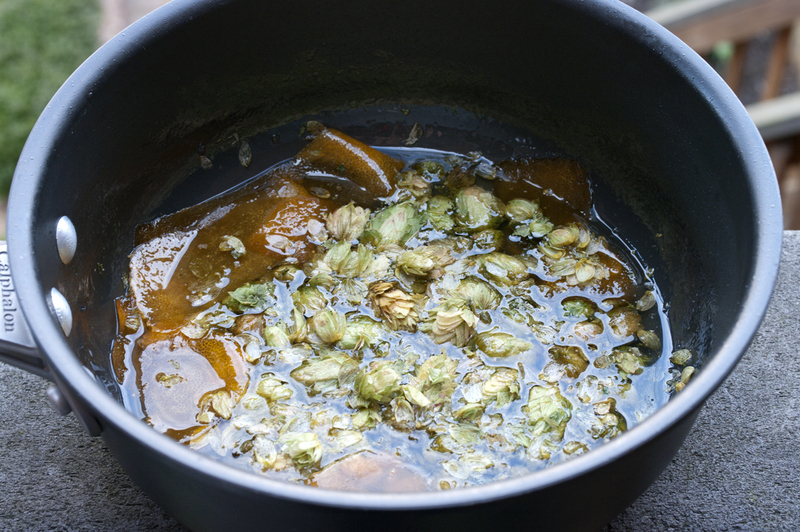 Step 3: Add one quarter ounce of leaf hops. I like to use amarillo hops. Cook for five minutes. Step 4: Let your syrup cool for about fifteen minutes or until cool. 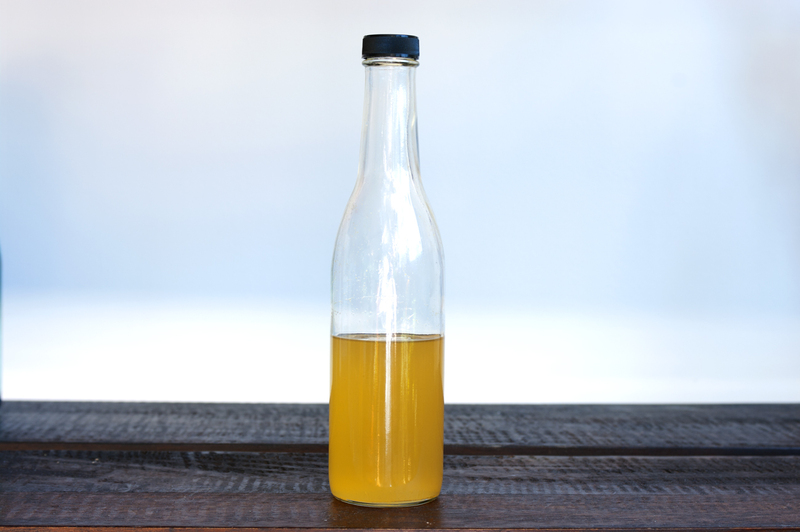 Double strain your syrup through a cheesecloth into a sterilized bottle. Your syrup can keep in the fridge for up to a month. 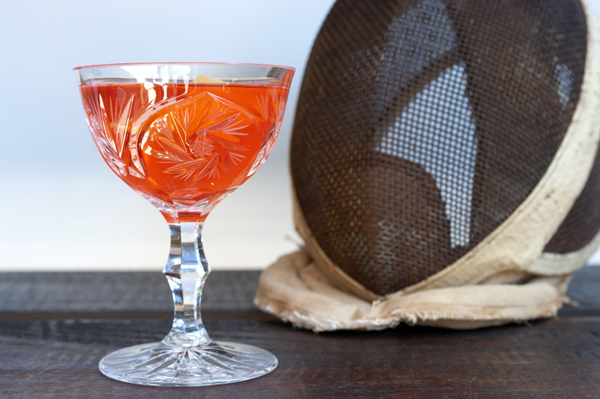 I’ve recently used the grapefruit hop syrup in this cocktail recipe inspired by the classic Lucien Guadin Cocktail. I’d love to know what creations you come up with. I think I’m going to try it in a Caipirinha. I think it will pair nicely with Cachaca. Stir all ingredients except the garnish with ice. Strain into chilled cocktail glass. Garnish with the grapefruit twist. Funny, I just tried some hopped grapefruit bitters for the first time yesterday! Didn’t really work in a Manhattan but would be aces in a Negroni. Yeah, I’m thinking it’ll work best with gin and Cachaca cocktail recipes. I’m definitely going to keep playing with the little gem. Nice idea, I love the grapefruity IPAs as well. I made this cocktail with bourbon, grapefruit juice, grapefruit bitters, agave, and a hoppy IPA. The hop syrup would be great instead of the agave. Awesome! Love it. Beer cocktails are always good this time of year. Great idea and post, especially since my bottle of the rather difficult to hopped grapefruit bitters are almost finished. What form of hops did you use? I am assuming, and hoping, that the dried whole hops, and not pellets or fresh hops? Also what type, or flavor, of hops? I’m not a brewer or anything but I understand the flavor can differ quite a bit between the verities. I just made this but added the zest of a lemon and after the syrup cooled I added the juice of the grapefruit. I used Cascade hops. It turned out great! I ended up using citra hops because my local brewers supply was out of Amarillo. Turned out great! I made a this for a Diageo promo, Ketel Citroen, pink grapefruit juice, hopped grapefruit syrup and peychauds bitters. Shook it with an egg white, it was delicious. Thanks for the recipe, love your blog. Jeff– Citra is a great choice for hops. Cocktail sounds tasty, cheers!